Why do Amish avoid public power? Amish do not use power from the public electric grid due to a belief that too much reliance on public power ties one too close to the world. Amish are cautious about worldly influences and ideas which may run counter to Christian values. Amish are careful about what they let into their homes, a fundamental sphere of Amish existence. While Amish do not see much to fear in an electric iron or vacuum cleaner in and of itself, with electric sockets in the home, any of a variety of devices could be plugged in and used. Electricity does not discriminate, and eliminating public power from the home prevents the temptation of using television, radio, and the internet in the home. Additionally, too much reliance on labor-saving devices, Amish feel, may deprive children of character-building opportunities to work. In Lancaster County, Amish had banned public power by 1920. Leaders saw public power as a threat for a number of reasons. Public power was considered a worldly luxury. Acceptance of public electricity was associated with a more liberal local group, the Peachey Amish, who had previously adopted it. Additionally, use of public power was also seen as a physical and symbolic connection to the non-Amish world. The decision to abstain from public power in the home, which has held strong for nearly a century, is a strong statement of Amish desire to remain separate (Riddle, Kraybill pp 198-202). What do Amish use electricity for? How do Amish generate power? Amish generate power in various ways. First, lighting. Some may imagine Amish relying on candles and oil lamps. 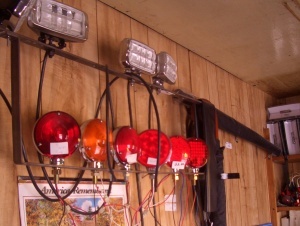 In fact, most modern-day Amish have left these forms of lighting behind. Gas is a common means of providing lighting or for powering other appliances. While many Amish use more sophisticated gas fixtures to light their homes, others rely on battery powered lamps to generate light. Flame lighting is not commonly used outside of more conservative Amish homes. A common piece of furniture in an Amish home is a rollable lamp, with a gas tank concealed in a square wooden cabinet on wheels. This allows the lamp to be wheeled to where it is most needed. In the evening, Amish typically gather together to read and spend family time in the living room, often with one or two lamps providing all the light that is needed for a large family. One drawback in the summertime, however, is the high heat generated by such lighting. The Ordnung of a given church district will dictate what type of lighting is acceptable. Interestingly, when purchasing a non-Amish home, some Amish churches allow a “grace period” (commonly, of 6 months to a year) during which the Amish family may continue to use electric power. This is in recognition of the high cost of adapting a non-Amish home to Amish standards. Amish often make use of electricity provided by diesel generators to power certain appliances. A device called an inverter converts 12V current into the 110V current that many devices run on. Amish typically make use of various batteries for devices such as flashlights, and will recharge them using a diesel generator. Some Amish, though not all, also accept the use of solar panels to generate energy to charge batteries, power an electric fence for livestock, or heat water. Donald Kraybill has called this form of electricity tapping into “God’s grid”. All of these forms of power serve a practical purpose, but are limited in scope, thus restricting the type of technology that can be used. Most Amish do not use more archaic means of generating power, such as windmills or water wheels. Amish will use wind power to pump water out of a well, however, and roof-mounted wind turbines have become popular in some communities. Most Amish in-home plumbing relies on air pressure. Amish use electricity provided by a diesel generator to power equipment such as washing machines. The same power source may be used to run a vaporizer to help a sick child, for example. Some Amish may use limited mixers or blender type appliances in the kitchen, but generally larger labor-saving devices such as dishwashers or microwaves are not used. Amish value work for the social aspect of it, and also in teaching children a strong work ethic. Amish do appreciate some tools that help them get things done faster, but with too many unnecessary labor-saving devices, Amish feel that they would be depriving their children of the character-building aspects of manual labor. How do Amish keep their food cold? Amish cool food in a variety of ways, but most commonly through the use of gas-powered refrigerators. These may be specially made or adapted from standard refrigerators. More conservative Amish may rely on an old-fashioned icebox. They may receive a delivery of ice, or in some cases, cut it from frozen ponds in winter. Amish also use coolers to preserve products they are selling from the heat, such as pies and cakes, and also to carry lunch, for example children going to school or day laborers to the jobsite. Some Amish do in fact use electricity in their businesses. The owner of a market stand business may make use of the electrical capacity provided in the stand. The use of electricity in this case is allowed as the stand itself is not owned by the Amish person, only rented by him. Amish may operate air hammers or a variety of tools using these means of power. Some Amish may have electric forms of lighting installed in shops, especially if working with flammable chemicals (ie, furniture finishing). 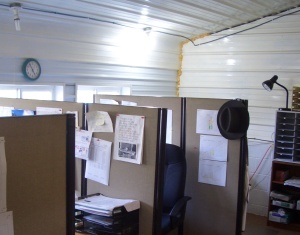 Generally, Amish allow a greater degree of technology in places of business than in the home or schoolhouse. Some more conservative Amish, such as Swartzentruber Amish, will not permit these means of powering equipment, however. In such cases they may rely on a line shaft attached to a number of belts which drive various pieces of equipment in a shop. Electricity while also be used to varying degrees on the farm, as in powering welders or electric fences to confine livestock. Gas engines are also used to power lawnmowers or weed whackers in some Amish church districts, though they would be off-limits in others. Amish also need lighting while traveling by carriage. While kerosene lantern lighting was used for a while in the early 20th century, some Amish in fact adopted electric lighting on buggies as early as the 1920s and into the 1930s, when its usage became widespread in Lancaster County (Riddle, Kraybill, p. 77-78). Electric lighting is widespread today, with some buggies sporting fairly elaborate turn signals and even strobe flashing lights, all designed to get the attention of motorists and prevent accidents. However, some of the more conservative Amish, such as the Nebraska Amish and Swartzentruber Amish groups, forgo electric lighting in favor of one or two kerosene lamps hung on the sides of the carriage. Yet most Amish, being safety conscious, take advantage of electric lighting and attempt to make their buggies as visible as possible. They are powered by an onboard battery, that may be located in the buggy itself, or in a newer innovation, hung below the chassis in order to prevent battery acid spilling inside the carriage in the event of an accident. Recently, an Amishman even developed an alternator to help keep the on-board buggy battery charged and prevent loss of lighting on roads at night. The Amish are not against use of electric power and acknowledge its usefulness. They seek to remain off the public grid in order to prevent worldly influences from entering the home, and as a symbolic means of remaining separate from the world. At the same time, they see value in limited use of electric power, and thus generate it by various means, making use of diesel generators, batteries, inverters, and solar panels, among other technologies. Amish use of electricity is another example of the measured Amish approach to technology, one that acknowledges practical needs while maintaining caution in adopting the innovations of the dominant society. Amish Online Encyclopedia: Do all Amish use the Slow Moving Vehicle (SMV) triangle? 46 responses to Do Amish use electricity? PEACHY Amish? Or do you mean BEACHY Amish? It’s elsewhere on the site, too. Nope, I mean the “Peachey” Amish as it is written here. The Peachey church was a separate group that in the early 1900s arose in Lancaster County and also adopted electricity. Leaders of the Beachy and Peachey churches later collaborated to a degree. I have a feeling that in the not-to-distant future, the rest of us will see that the Amish got it right. When the next major solar storm cuts off communications, power blackouts have us wandering aimlessly in the streets they will be as theyve always been- self-sufficient and happy. I find myself in complete agreement with their way of life, even if I myself, am far too soft to ever take it on. Um, what? Im pretty sure when the power goes out, I’ll still have a house to live in. Not sure why Id be wandering the streets, aimlessly. Then again, that may just be you, my friend. I think the Amish have it right on being off the public grid. We must remember that in case of a power failure being connected to both solar panels and public utilities will result in no power at all. That is unless we have am automatic transfer switch because the power company doesn’t want their workers electrocuted by our power. Being completely off the grid works just fine. Photovoltaic solar panel setups that also feed into the public grid do not suddenly ‘fail’ if the public grid fails – they will still convert sunlight into electricity to charge the batteries. The public grid is fed by the solar panels if the batteries are full and there is excess electricity being produced that is not being consumed by the property, not before. A connected public grid is used as an electricity supply only if the batteries are exhausted and also the solar panels are not producing enough electricity to meet the demands of the property. Otherwise, there would be no point in having photovoltaic solar panels and batteries – you would already be feeding your electricity straight into the grid and not able to use any of it. 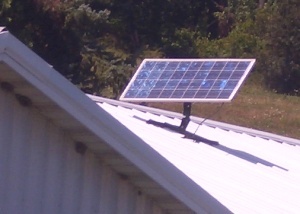 Both setups can be used – a solar panel can still power devices without batteries only the overflow will go into the grid. Think of it like a liquid. Your devices drink it, your batteries pool it & the grid is down hill. My inverter is the tie to grid type so even with batteries my power goes down with the grid. This is the cheapest solution and is suitable for plug together systems requiring little technical skill. Automatic transfer (Gen Trans) switches are required by code if you have a standby generator or a rooftop solar array. If you have a standby generator, there will typically be at least one circuit that is then powered when the mains go off. If you have a solar array – especially if it is leased – they may not have set it up so a circuit remains powered. That’s something you have to request (unless you are also installing a battery storage system.) But you can certainly have electricity available from a solar array when the mains go down. No reason it has to be a stand-alone system. I agree I think the amish have it right! I know I would go crazy without my phones, internet, tv and satelite, of course that good ole electric with the good ole huge bill that comes with it. However I also know how to live without it from roughing it camping and living life in general. Our electric went out the other day for 3 hours everyone was freaking how I was gonna cook supper. My response “easy start a fire in the gas grill lol I do not like cooking with the propane so we converted a gas grill someone graciously gave to us into a wood fire grill. So I went outside got a fire going got the coals just right (the hard part i might add) and cooked up some cheesebugers, even tossed a can of bushs baked beans on there and opened a bag of chips easy enough. Most people would of been running to town to go out to eat or juat ate a lunch meat sandwhich. I always say I want to be amish if I could keep my bad habit (smoking cigarettes nothing illegal of course) on the occassion cuss cause i am stressed, and have my electric, tv, phone and net….I would love to get around with a horse and buggy other than it takes you an hour according to my amish friends to just get a mile. I have horses and cant even manage to get to my neighbors on one of my horses we get at the property line and they are throwing a hissy fit to go back home! I have a feeling in the not to distant future its going to be almost impossible to afford to drive getting almost that bad now. So guess we are a little ahead of the game we have the horses, need a buggy oh and a horse thats not too spoiled to actually leave home! Yet the same horse Im complaining about my amish friends son who trains my horses now rode him all the way home which is about a mile or more without too much struggle he said he had a time getting him home but boy the day he brought him home he was full speed ahead wanting to get home to his mommy… and spoiled lazy life! What? why does everyone assume that using electricity makes you mentally handicapped? You’re power was out for 3 hours so everyone thought they were going to starve to death? And they didnt have the common sense to start a fire? You’re boasting using a grill? Maybe its because Im from Ohio and not NYC, but no one here lacks the knowledge of how to cook on a grill. Its actually pretty common, most people do it once or twice a week in the summers. I understand why the Amish use little to no electricity, as far as developing/maintaining a work ethic. I can actually agree with that, but cmon already guys. Well yes Ohio has a kinda big Amish population and yes grills are the best. but But really people just know basic facts about the Amish, like: They ride in a horse and buggy or, they use no electricity. This was such an informative article. It was very thorough, & I learned a lot about the Amish. I had no idea that electricity could be considered acceptable, with conditions. I am very glad I have normal electricity. I was without the internet for 15 minutes due to a tornado warning. I gotta say. It was the most boring 15 minutes I’ve had in quite a very long time. I love the internet and do think it is the greatest technology achievement for modern households in the past 50 years. I wish I was amish right now because now if you want to be on the grid you have to have a smart meter. I am afraid of the radiation that is being released from the smart meter. I’m afraid of the EMF and RMF that is given off of the smart meters especially when being combined with smart meters on all my neighbors. Do you need a tinfoil hat or do you already have one made? You are correct that your ‘smart meter’ is emitting electromagnetic radiation. Electricity flowing through cables and devices also produces magnetic fields. The current body of evidence collected over at least the past forty years shows no increased risk of cancer or other diseases over the usual incidence rates for a demographic population, including children, for electromagnetic radiation from mobile phones, everyday electronics and appliances, and other transmitting devices like smart meters, two-way radios, and garage door portable button keys. The wavelength of the electromagnetic radiation of radio waves (including those for radio broadcasting) starts from around 0.1 m and increases to 100,000 m or more – this precludes the possibility of harmful effects to the human body or DNA as it is not small enough to ionise atoms and molecules, or to excite molecules in the body to cause warming. The Earth has a natural magnetic field that protects us from harmful electromagnetic radiation coming from the Sun and space, and constituents of our atmosphere also help to protect us from harmful electromagnetic radiation coming from the Sun and space. There is harmful electromagnetic radiation to humans – this is typically of a very small wavelength that is able to ionise atoms and molecules, and thus cause damage to DNA and the body (for example, gamma radiation and X-rays) – although a small exposure is a fact of life from the Earth (we actually have elements in the body that emit gamma radiation) and from space – excessive exposure is what will cause health damage or death – but not from everyday exposure. I really don’t understand the Amish. They think it ok to use gas but not electricity from the power company. Seems odd to me. What are they exactly? Cult? Religious clan? What? Long dresses and hats in the summer? Seems way too old fashioned to me. To each their own I guess. AND THE WAY THEY DRESS, IT’S OK WITH ME. BUT WHATS CONFUSING ME IS ALL THESE RULES THAT DIFFERENT AMISH GROUPS HAVE. SOME CAN HAVE ELECTRICITY,SOME CAN NOT. IF THEY HAVE A PHONE IS NEAR A ODD HOUSE OR SOME WHERE THAT IS DIFFCULTY TO GET TOO, THAT DOES NOT MAKE ANY SENSE TO ME, YOU STILL HAVE USE OF A PHONE NO MATTER WHERE IT IS LOCATED. I ALWAYS THOUGHT IF YOU ARE AMISH YOU ARE AMISH AND ALL THE RULES FROM THE CHURCH WOULD APPLIED TO ALL GROUPS, WEATHER THEY ARE FROM CALIFORNIA,OHIO, PENN. INDIANA. NO MATTER WHAT THEY STILL HAVE TO USE SOME FORM OF LIVING TECH. IN THIS HIGH TECH WORLD WE LIVE IN. That is the reason, why women are NOT allowed to preach. They mix things up and claim things to be unbiblical, while it’s as clear as day that this and that is mentioned several times in the Bible. You should repent for calling the LORD “cruel”. If shunning is “cruel” for you, then you’re insulting the LORD, because He COMMANDED every Christian to shun heretics. Talking about heretics: The Amish are heretics themselves for making rules that really are unbiblical. They ban electricity for the wrong reasons. If they’d say that banning electricity is necessary for the destruction of the techno-industrial society, then it’d be the right way, since industrialization has caused humanity to suffer more than anything else in human history. The techno-industrial system is the Egyptian slavery, that God mentioned to lead the unbelievers back into for not keeping His commands. People need the LORD Jesus Christ to break free from this slavery. The LORD also freed me from this evil system, just like He did with all the holy Apostles. May the LORD guide these blinded Amish to become Christians, and may He protect us from their wrong path. Amen. they portray it at all. The groups that do practice strict shunning are a minority. And the people leaving the Amish usually make it sound worse than it is to justify themselves. Fascinating that the Amish have avoided the epidemic of Autism, diabetes, ADHD and heart disease that people on the Standard American Diet (SAD) are suffering from. Fresh, unpasturized milk and no pesticides on their food. I find it somewhat confusing that the Amish would selectively use technology where some of this technology has come about in the pursuit of time saving and reducing work and effort. It seems somewhat contradictory that the Amish would pursue a life of simplicity and hard work to promote socialising and self improvement, but will allow themselves to selectively benefit from advancements that came about from people seeking to reduce their need to work, be patient and deliberate, or socialise/contribute in the family or immediate community. I realise I am being quite ambiguous, as I find it hard to select specific examples as people’s intentions in invention and innovation are not always known or accurate, and some of this invention and innovation is stolen. Androo – it confuses me as well. As it has confused generations before us. And yes, the selective technology is stolen, that’s one of the things that sort of disturbs me about the Amish. No Amish spent years researching technology to come up with the smart phone, or spent money and years researching how to make gasoline for their generators, or spent money on tuition to understand and research how to convert the sun’s power into electricity. It seems a tad selfish that the Amish go to school until the 8th grade and no one contributes intellect to the world and community at large, yet take what the rest of us heathens have been working hard on, spending millions in R&D on, and using it to their advantage without a thought as to how the technology became available in the first place. The fact is – the Amish think the sheep will be few, and the goats (us) will be many, when the Rapture occurs. When they say stay separate from the world, they mean it. Even if that means not sharing with the rest of the world and taking intellectual ideas from the world without participating in it. I used to think their carbon footprint was small – and yet it took a lot of carbon to make the gas that runs their generators, a lot of carbon is released when they burn oil, or wood and chop down trees, a lot of carbon to make propane, even carbon is used in the making of solar panels. Electricity – especially made in hydro electric plants – are very clean. I can understand and appreciate the Amish not using automobiles, yet, there is a lot of carbon used in the making of food for the horses. So I wonder if there has ever been a study in the carbon footprint of the Amish. I think we would be surprised at the results. However, with all that said – the Amish have contributed enormously to the industry of organic farming. I believe there is an Amish man in Canada who has been working on eliminating certain crop blights by using natural means, ie. insects that eat the bad insects. So that is one contribution intellectually to the world by the Amish. And it is a big one. Sorry this is getting long again – Technology has increased the standard of living for so many people on this earth, it has clothed, fed, and healed them far more than any religion has. I guess what I’m trying to say is I wish the Amish peace in their isolation, I also wish they would share intellect and participate in the world a bit more generously. After all, at the Rapture, God will say to the goats…. I am not trying to insult or disrespect the Amish in their chosen way of life. I love their simplicity, I admire their hard work, I love that they take care of each other from cradle to grave – I wish their model of living life would spread – albeit with technology. But that will never happen – and I’m okay with that. It’s just confusing. I read this post and after I was finished I had to wonder what in the world you were going on about. The Amish adapt to technology. Unlike the English they examine the technology and balance its effectiveness against the impact it will have on the home, family, church, and community. If the impact seems minimal, with the agreement of the church that particular technology might be adopted. If it looks like the impact will be negative it just won’t be. The technology is available in stores for sale. I have never seen where folks have to express their appreciation for each item of technology they purchase. The appreciation is included in the price paid. The Amish are constantly coming up with inventions. Contraptions that help them on their farms or in their shops and yet stay within their church standards. The first thing to come to mind is the many developing countries that have been immensely helped by Amish businesses like Pioneer Equipment or by Amish-organized events like Horse Progress Days. Farmers in many parts of the world where large-scale or tractor farming is not feasible or affordable have benefited from Amish “research and design” as they improve their farming methods and adapt small scale farm equipment to make their farms viable. The second thing to come to mind is the group of local Amish who arranged to bake literally thousands of homemade cookies. Last Saturday a group of local Amish & Mennonite volunteers took these cookies to a large medium-security prison here in Ohio and spent the day passing out these packets of cookies and cards to the inmates, taking what time was possible to talk with any interested inmates on a personal basis. Those were the first two things off the top of my head… As for the sheep & goats, you are so right, BUT those labels (sheep & goats) are NOT applied depending on Amish or non-Amish — they are dependent on how one lives IN Christ, has one ACCEPTED Christ. Not all Amish are Christians, but not all Christians are Amish, is one way of looking at it. I certainly don’t expect to find heaven full of only Amish people! …I did not know that some Amish do not believe in Christ! That is totally a new one for me. And very interesting. I guess I was basing my knowledge on the PBS doc (that’s where I got the Sheep and the Goats idea from) that talks about the history of the Amish and assumed that carried over into this century and the fact that they go to worship every other week. Don – I think you misunderstood my post completely. Appreciation for technology is completely different from contribution to the Global brain. But – as Mark pointed out, the Amish contribute in the ways that they can, in farm equipment and like I said, organic farming. And that is definitely global. My point was – there is not much contribution to the world around them from an “Intellect/Invention” concept. I think my comment was too pointed originally. I should have softened, condensed, and made my point with more economy. And I should not have used the word “stolen”. Appropriated would have been better. So sorry if I upset anyone. It’s true each district has church every other week, but that no-church Sunday is a chance for many to attend church in other districts other than our own. On Sundays we don’t have church or attend in another district, we have a much more informal family worship at home. I would venture that there is an inconsistency around using the products of modern society and being fiercely opposed to what makes those products possible. Children’s Tylenol comes to mind. I don’t consider it some horrible damning thing, but a signal like a check engine light, that maybe the ideal pursued isn’t universally sound. On the other hand, I see the defensive response to suggestions that, (the ideal being pursued, isn’t universally sound) as really dangerous. When check engine lights are respected for what they are, the integrity of the vehicle isn’t compromised. But when, critique is verboten, in my opinion, the intent of the enterprise is doomed. I think the separate and apart concept as practiced by the Amish needs to be revisited. Starting with the rejection of education. The implication of Kraybill’s reasoning for why the Amish rejected modern education, suggests that Amish values couldn’t have held their own in a free exchange of ideas. There is something condescending about that. The Quakers embrace values not all that different from the Amish. They foster strong opposition to war. They question the group mentality of pop culture. Many maintain close connections with the land, yet a recent magazine article, in a review of institutions of higher learning, listed three Quaker affiliated institutions as the best in the country. Embracing education does not equate to surrendering ones identity and values. Rejecting it though, could end up producing a loss of identity and values. The Amish cultivate an environment in which docile acquiescence is revered and rational thought is equated with heresy. Add to this dynamic, how fashionable moral relativism is in the non Amish world when discussing Amish issues, and see how isolated the Amish narrative becomes from anything remotely resembling edification. Wouldn’t it be amazing to meet an Amish Neurosurgeon or an Amish Cardiologist? Or an Amish Engineer? Or an Amish Architect? Or an Amish Professor of Pennsylvania Dutch/German? Or an Amish Veterinarian? Or an Amish Vaccine and Research Scientist? These are all professions that could and would be used in any Amish community. They would all contribute to the world at large. Yes, they require extensive post graduate education. But wouldn’t it be cool if they came back to their community to help them, live with them, and still be Amish? There’s not enough land, nor money, for every single Amish youth to own and work a farm. Many Amish work in factories – tell me what is the difference between going to a factory to work and going to a surgical unit to work? If they are already with one foot in the factory, aren’t they already one foot out of the Amish world? And does that matter so much? I would love to know the amount of Amish who work in factories (which are many in some parts) who leave the Amish. I don’t think many do. So I don’t see a difference in the Amish – in acquiring education for a much better, more satisfying and ultimately, more Christ-like profession like that of a physician – than with a factory worker. They both leave work for an Amish home and their Amish Family. I agree – I wish they would revisit education. But I doubt they will. Not after winning the fight at the Supreme Court. It would make that epic fight the lesser in their history. And I don’t think they want to do that. With all due respect, I don’t understand something about your comments. Why do you care? You aren’t Amish, so it really does not affect you. They are not forcing their beliefs on you, so what gives you the right to make any suggestions about the way they live or what they believe? I do hope this does not sound too harsh, because that certainly is not my intention. If it does, I apologize in advance. It is a legitimate point that I may not have a right to make suggestions. But if the argument is that influencing the Amish is off limits, then there need to be some agreed upon ground rules. Social scientist have concluded that just being observed affects the subject being observed. Do you also question the existence of this web site? Why do you care about the Amish? Is the attention you give to the Amish benign but mine malignant? How is the general tone of this site unlike the murmuring of attendees at a zoo? Should there be a rule that you are only allowed to say something favorable or nice about the Amish if you are willing to join them and be Amish. If positive observations are acceptable, and reasoned critique isn’t, how does that not skew the perspective? How does a gratuitously over inflated positive point of view, not adversely affect Amish life? Would you want your child’s friends and the people they have contact with to only praise them, no matter what they would be doing? Is there a point where condemnation of engagement with Amish issues is a form of claiming the subject? On what authority do you question my engagement with Amish issues? Are you Amish? Is this your subject? On what authority do you get to define what is acceptable discourse on the Amish? Once again, I am sorry if I sounded harsh. I just long for the days that this website was positive and up-lifting. So often, it seems like people come here just to stir-up controversy. You are certainly entitled to your own opinion. I would never wish to take that away from anyone. I guess I was just raised to believe that if I could not say something positive about other people, I should not say anything at all. With that, I wish you a very Merry Christmas and God’s peace throughout the New Year. Harriet, I’m sorry to hear you don’t find it positive here anymore. This is an open place for discussion, sometimes over difficult issues, but it is just as important that it is civil and welcoming as well. I will try to do a better job of making sure that is the case. Erik, I absolutely do not blame you or what you present to us. Your articles are very positive and I always look forward to a new post. My point is directed to those who seem to belittle the Amish every time they write. Even Mark made some reference to it the other day. Anyway, that’s my two cents worth. Hi Harriet – I really hope that you are not accusing me of belittlement of the Amish People and Society. Because belittlement is the exact opposite of the nature and intent of my posts. If I were to belittle the very subject of this website’s existence, that would accomplish nothing in my quest for knowledge of the subject. And besides that, it would be very uncool. I am not sure that you understand the difference between critical analysis and arbitrary criticism. I am also getting a sense that, perhaps, (and please correct me if I’m wrong)you don’t realize the utmost importance critical analysis (or critical thinking as some people call it) has in the learning any subject. In the Jesuit system – one does not learn by rote, one is encouraged to employ reasoning, logic and critical thinking to “experience” the subject at hand. The nature of “reflection” is even further than that, it helps us arrive at a meaning. And finally “action”, one is expected to use the knowledge acquired, not just keep it stored up in the back of the brain. You can google IPP and learn about the subject more in depth if you find it interesting. So, when I state something like “I wish the Amish would revisit education past the eighth grade, so as to better serve God…” – that is a step in my learning, the step of Experience. I seek to understand, so I use reason and logic and criticism in my process of learning more about the Amish People and Society. I’m not saying “Amish people are dumb and uneducated”. That would be an arbitrary criticism as well as being untrue. I hope this helps you to understand that I am not here to belittle the Amish. On the contrary – I am applying the best methods of pedagogy that I know of to learn more about them. I am fully engaging the subject with as much gray matter as I can. And that is not belittlement, that is high respect of a worthy subject. Thanks Harriet, I understand. I am very glad you look forward to new posts. Just one general thought–I think people here have different perspectives on the Amish–some have a more idealized view, while others maybe have had more experience with the Amish as people and realize they are very human as well. And those two perspectives can conflict. On "the murmuring of attendees at a zoo"
It is in the context of Judith’s description of critique being about “high respect for a worthy subject” that “so what” could use some elucidation. You say there are “many examples of deeper discussions here.” But based on the definition Judith provided, just how much “high respect for a worthy subject” can be found here? Or maybe more importantly, is the underlying-guiding intent of the site to promote a high respect for a worthy subject? Where ever that judgment may fall, the important context is whether a (based on the criteria Judith provided) high respect for the Amish subject exists at all, anywhere. In the larger non Amish world, we make distinctions that place value judgements on who is providing the information. Is it a head line seen at the grocery store check out line or from a publication using more acceptable standards? Do their editorial decisions lean one way or another? This can also be taken into academia. In the non Amish world, for any subject that is important to us, absolutely no one gains stature in a field unless their work has been extensively peer reviewed. Those who achieve revered status will typically defend their work in a debate format from others who have also studied in their field. If any one wants to point me in the direction where this type of engagement on Amish issues can be found, I’d appreciate it, cause I certainly don’t know where it exists. It is in this vacuum that the “murmuring of attendees at a zoo” has a far more pronounced impact than what might be the experience with other subjects. If you can’t find the edification you’re looking for on the fan page of the band you don’t like, I’m pretty sure there are other options available for you. Not only can you find someone who also doesn’t like the band, but an infinite degree of perspective on who their influences were, which bands are almost like them but not quite and on and on ad infinitum. There is even a field in anthropology which studies cultures through their music. Pick almost any field and there is almost no limit to the depth one can immerse ones self in it. With the Amish, not so much. The implication of this is that the voices addressing Amish issues, such that do exist, have a defining impact on the Amish story. Anyone, whether it’s Joe Smoo at a cocktail party, some comedian with an audience of millions, or a commenter on this site, can almost make up anything about the Amish that they want and it tends to get absorbed into the larger narrative as if it had relevance. With the subject of the Amish, not so much. Geniene – you are right in that there is a dearth of websites on the internet that lean towards the academic. I feel your pain. I’ve been searching too. But that makes me all the happier that we have this site. It’s great that Eric keeps up with the latest news about the Amish, so we won’t miss anything. And hey, you and I are here. We may not be doing a thesis at Yale on the Amish, but we can somewhat satisfy our curiosity and passion for learning about the Amish. It only takes two people to have critical discourse, you know – the du and ich sort of thing is all it takes to discuss the Amish the best way we can. We might be the blind leading the blind – but at least we’re trying. Who knows, maybe more will join us once they see we’re not trying to diss the Amish. You were not too harsh at all. They are all good questions. The fact that you ask questions, any questions – means you and I are a lot alike. — I was born with a blessing (and a curse at some times) – I was born with an unending curiosity that never seems to be sated. I love looking for the unknown, and I am a dreamer. My father was a dreamer and was also born with this curiosity which he inherited from his father – he was a great engineer, his work pioneered in space travel in the aerospace industry and then in the second half of his career – in the advent of computers. My brother has it – he holds 6 United States Patents and works with NASA and others in Silicon Valley. You probably have owned or touched something that was there because of his inventions. I have it and it has led to two Master degrees in two totally different subjects and a Doctoral. There really is no subject on Earth that I’m not curious about. “The overview effect is a cognitive shift in awareness reported by some astronauts and cosmonauts during spaceflight, often while viewing the Earth from orbit or from the lunar surface. Now, Harriet, I am not inferring that I went to space, but I don’t need to in order to understand what they were talking about. My curiosity extends to the global society. How to better our lives on this “pale blue dot”. What is important and what isn’t. My curiosity about Amish Society is illuminating a larger curiosity – is Global Peace attainable? The Amish can be a piece of this puzzle, so it affects not only me, but everyone on this planet. Every right under the Constitution. However, I am not suggesting anything to the Amish. The Amish don’t read this site (at least from an Ordnung standpoint they shouldn’t be). I have never met an Amish person and I would never suggest anything to them about changing their Ordnung. The words “Wouldn’t it be amazing if….” have been uttered by all dreamers, be they writers, artists, researchers looking for a cure, scientist, physicists, engineers, explorers…etc. etc. throughout the history of humankind. Without the right to dream, we become protozoan and soulless. So Harriet – you and I are not so different. You were curious too, you asked questions, you sought and you found. The Amish don’t read this site? Guess again! Not only do some of us read this and occasionally post on it, you might be surprised to learn it sometimes causes some discussion in a few work places. Now that makes sense to me! You are Don’s son. Was Don also Amish at one time? I’m sure you get tons of questions on this site – so if I ask too many and you have already answered these questions elsewhere on the site, please feel free to direct me there. What Order do you belong to? You must have access to a computer – is it for work? Do you actually own a computer? How do you power up your computer? Does your Ordnung allow computers at home? Are you on a smart phone, and if so when did your Order allow smart phones? That would be a whole thread in itself, because I have a ton of questions about smart phones and the Amish. In fact, my questions are so many and my curiosity is so great, I think I would bombard you with way too many questions all at once. I will try my best to spread them out over time (though it will be hard for me to hold back). So, very cool that you are here and you are Amish, and very cool that you read these comments and talk about them with your Amish colleagues. It would be interesting to know what your Amish friends think of these comments. Anyhow, thanks for letting me know! Judith, I’m Mark, but not Don Curtis’s son Mark. Sorry to be brief, but I am traveling out of state. No, I don’t own a computer but do use at work or in this case where I can access one while traveling to check in with work. And my time is less than 2 minutes on this one before my time expires. Just a general observation, not directed to anyone in particular–I think one of the biggest challenges of electronic communication compared to in-person or even phone conversation, is that it lacks context. There is no body language, inflection, tone, etc. to convey meaning. Having the same conversation–actually speaking the same words written as a comment with someone “in person” may result in those words coming across quite differently. Also, the need to be brief, or type something out on a small keypad on a smartphone, can affect the quality of communication. There is not as much space to be polite or fully explain oneself, or react in “real time” when we see our meaning is not fully conveyed. So, maybe this is another reason why the Amish are not going to be flocking to electronic means of communication anytime soon 🙂 This is just something I try to keep in mind–though I’m not always successful–when I am reading and responding to anything electronic, be it comments, emails, text messages, etc. It’s all very handy but also limited. Leave a reply to Do Amish use electricity?